About this time last year, I made my first visit to Montrose. 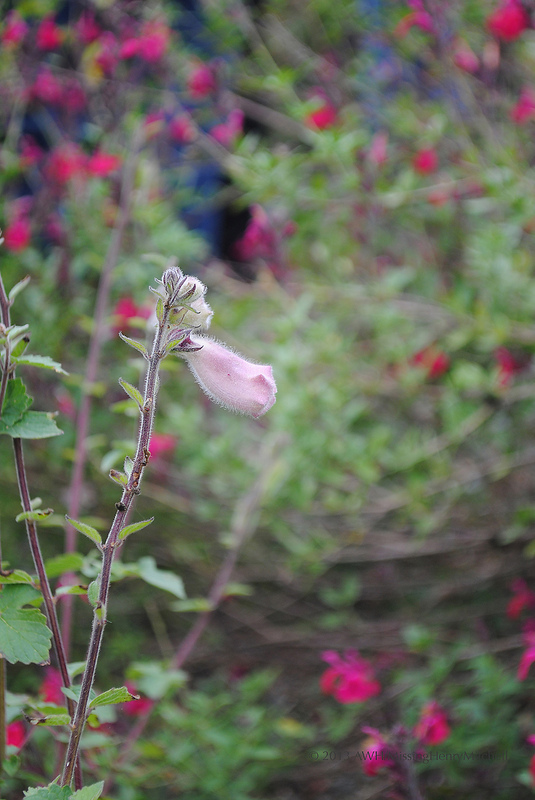 On a tour of the gardens there, I became bewitched by Ceratotheca triloba, sometimes known as South African foxglove. That’s a shame, for Ceratotheca triloba has been perfectly charming for me this year and would probably be equally well behaved in others’ gardens, should they learn about this under-the-radar gem. I started some of the seed at home and planted out two sturdy seedlings. They grew for me, flowered for perhaps three months, and produced seed. I cannot ask for more. In dry, light shade it performed well, if it sagged a bit in its old age. (Who doesn’t?) I might have done a better job pinching it early in the season to coax it into a more shrubby form. As you might imagine, bees love the long, drooping tubular flowers. My form is more lavender-colored than the pink one I saw at Montrose; I don’t know if the color is impacted by pH or sun exposure, or if it just naturally varies a bit. Next year I’ll experiment with its placement and see what I can learn. Ceratotheca triloba seed pod, ready to spill its contents. On my desk sits an envelope full of homegrown little black seeds, waiting for their chance to fill the abundant vacancies in my garden. I allowed some seed to sow itself naturally; if I remember not to mulch over the spot too heavily, perhaps I’ll see Mother Nature’s design work next spring. Ceratotheca triloba is an annual, and there’s no excuse for not trying it next year. I’m sure you’ll love it as much as I do. This entry was posted in Annual plants, Backyard Blooms, Communing with Nature, Garden log, Garden plants, Ornamental Plants and tagged african foxglove, annuals, ceratotheca triloba, gardening, seed saving, self seeding annuals by missinghenrymitchell. Bookmark the permalink.